KENYA – Alumna of the American University of Armenia (AUA) Zara Mkrtchyan (MPH ’99) was recently selected for the position of International Expert at the World Health Organization (WHO) in Kenya. In January 2014, Mkrtchyan became involved in a global initiative between WHO, the United Nations International Children’s Emergency Fund (UNICEF) and the U.S. Center for Disease Control and Prevention (U.S. CDC) to target worldwide polio eradication. Through a highly competitive selection process conducted by the U.S. CDC and WHO, Mkrtchyan has been selected as an international expert to support the Ministry of Health in Kenya and the WHO Country Office to respond to this public health emergency. Many countries have already successfully eliminated polio, however in some countries the disease is still endemic. Kenya is one of the countries with ongoing regional polio outbreaks, which began in Somalia and spread to Kenya, Ethiopia, South Sudan, and Uganda. In response to this outbreak, the U.S. CDC, WHO, and UNICEF send public health professionals who support the countries by providing appropriate responses to the outbreak: supporting the countries in routine and supplementary immunization, helping to design advocacy, communication and community/social mobilization campaigns for immunization, as well as providing guidance on immunization and disease-related data management. In this position, Mkrtchyan will share her technical expertise in data management with staff of the national disease surveillance and response services in Kenya, in order to strengthen their capacities in providing a more effective response to public health emergencies through the collection and management of high quality data. With a team of public health professionals, she will conduct a polio outbreak risk assessment in selected counties of Kenya so that the Ministry of Health of Kenya, with support from international partners, can effectively allocate resources to the high-risk regions. 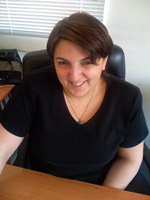 Prior to this, Mkrtchyan worked as Research, Monitoring, and Evaluation Specialist in several USAID-funded health programs in Armenia, including the Health System Strengthening in Armenia (HS-STAR) project and maternal- and child-health related projects NOVA and NOVA 2. She was also employed by AUA’s Center for Health Services Research and Development. Mkrtchyan has also been involved in providing short-term technical consultancy for several United Nations agencies in Armenia and Central Asia in the areas of family planning, maternal and child health, tuberculosis control, and other important public health issues. Mkrtchyan’s public health education (AUA MPH ‘99), coupled with extensive experience in Armenia and the region, prepared her for this competitive international assignment with WHO.